Posted by Torch Staff on November 7, 2018 in News, Top Stories. Michigan voters elected new democratic governor Gretchen Whitmer and passed three major proposals in the midterm election Tuesday, Nov. 7. Whitmer won Michigan’s vote with 50.32 percent of votes to Republican candidate Bill Schuette’s 46.84 percent, according to the Michigan Secretary of State (SOS) website. Libertarian candidate Bill Gelineau received 1.4 percent of Michigan’s votes and the other candidates each received less than 1 percent. 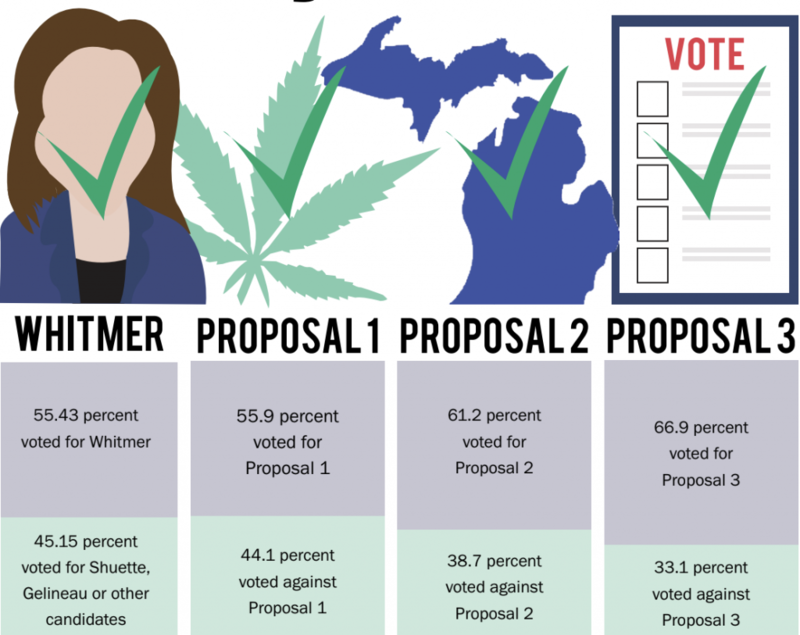 All of Michigan’s proposals also passed, including Proposal 1 regarding marijuana legalization. The proposal passed with 54.95 percent of voters in favor and 45.05 percent opposed, according to the Michigan SOS website. Voting to pass Proposal 1 legalized the recreational use and possession of marijuana for Michigan residents over the age of 21. The proposal also approved putting a tax on marijuana. Though it has gained a lot of support, some citizens who were opposed have been openly concerned about the fact that there is no current way to test the amount of marijuana in one’s immediate system when they are driving. Michigan’s voter turnout for this election was over 385,000 more than the past two Gubernatorial Election years, according to the Michigan SOS website. Ferris construction management freshman Christopher Terrell said this was because the proposals on the ballot were aimed towards young voters. Proposal 2 passed in another close result with 59.87 voting in favor and 40.13 opposed, according to the Michigan SOS website. The proposal will now have 13 random voters redraw election district lines instead of elected officials. “I’m hoping that we will have peace in Michigan and that we will come together. I want this election to benefit the people.” Terrell said. Proposal 3 covered voting policies in our state and passed with 65.13 percent of the votes in favor and 34.87 percent against, according to the Michigan SOS website. The proposal will now add eight additional policies to Michigan’s Constitution to make voting easier for citizens, including straight-ticket voting, automatic voter registration, same-day voter registration and no-excuse absentee voting. “I’m not opposed to people getting their right to vote in an easier way. I think that’s everybody’s fundamental right,” Burch said. Many Ferris students say that more than anything, they hope this election brings Michigan closer together, regardless of political beliefs.